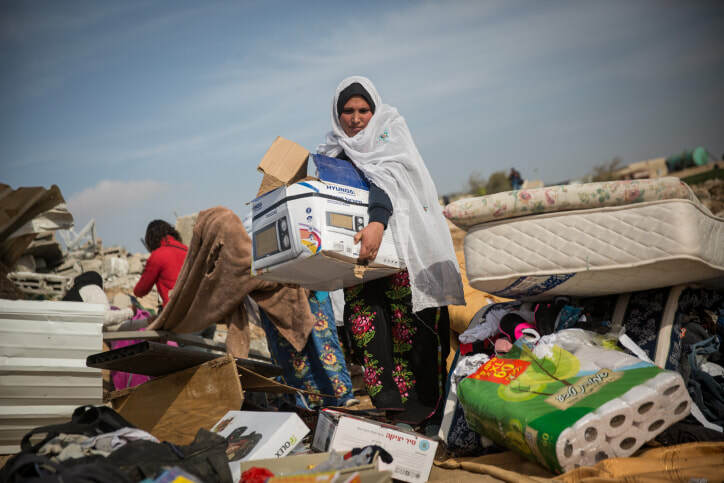 Bedouin women collect their belongings from the ruins of their demolished homes in the village of Umm al-Hiran, Negev desert, January 18, 2017. Israeli authorities have promised the courts that the displaced Bedouin residents would have an opportunity to live in the new community. New documents show that is far from the case. Despite assurances made to Israel’s High Court of Justice, a new town being built on the ruins of a Bedouin village in southern Israel is intended for Jews only, according to the bylaws of the future town’s cooperative association. Israel first notified the residents of Umm al-Hiran, Bedouin citizens of Israel, that it plans to demolish their entire village and build another community in its place 15 years ago. A legal battle has been taking place ever since, although Israel’s top court ultimately approved the plan — partially based on assurances that the current Bedouin residents would have the option of living int he new community. The National Planning and Building Council, which first approved the plan to build the town atop Umm al-Hiran, had promised it would be open to all Israeli citizens, regardless of religion or nationality. The High Court took the state at its word when it claimed Bedouin would be allowed to live in a future Hiran. Adalah Attorney Myssana Morany sent a letter to Israeli Attorney General Avichai Mandelblit on Monday, demanding he prevent the allocation of plots in Hiran to the “core” group of the town’s cooperative association, and ensure that Umm al-Hiran’s current residents are included in the new town’s planning. Israeli law offers two seemingly contradictory stances on ethnic or religious housing segregation. On the one hand, the state cannot discriminate in the allocation of land to its citizens. On the other hand, communities are allowed to exclude would-be residents if they would alter the character of the community — meaning they can discriminate on any number of grounds. Prior to Israel’s founding in 1948, Umm al-Hiran’s residents lived northwest of where the village currently stands. Like many Bedouin, they were expelled during and after the 1948 war, and like most Arab citizens of the nascent Jewish state, they were placed under strict martial law until 1966. The Israeli government now wants to move the resident of Umm al-Hiran to the nearby urban area of Hura, one of seven townships built to concentrate Bedouin villages in the area. As my colleague Amjad Iraqi previously noted on these pages, segregation is not a new phenomenon in Israel: it has been embedded deep in the DNA of the state since its establishment. Through legislation that allowed the expropriation of land owned by Palestinians who fled or were expelled in 1948, along with policies of quasi-governmental organizations such as the JNF and Jewish Agency, Israel has been working tirelessly to secure maximum control of land for Israel’s Jewish citizens. Meanwhile, it has done its utmost to contain the spread of Palestinian communities through home demolitions, discriminatory planning, and unequal resource allocation. Aside from seven Bedouin townships, not a single town or city has been built for Israel’s Arab population since 1948. In a sense, the saga of Umm al-Hiran brings the story of Israel’s discriminatory land regime full circle. Like dozens of other Arab villages, Umm al-Hiran’s residents were first expelled to make room for a kibbutz. The calculus of the Israeli leadership in the 1940s and 50s was that new Jewish communities — kibbutzim, moshavim, development towns, and cities — would be built atop Palestinian villages depopulated during the Nakba in order to prevent the return of refugees, to act as buffers on the frontiers of the new state, and to prevent the remaining Palestinian towns and villages from expanding. Today, however, the state no longer needs to hide behind those excuses to displace its Arab citizens and take their land. Today, the state can simply advance plans that deprive one set of citizens of their rights and their homes, simply to benefit another set of — Jewish — citizens. 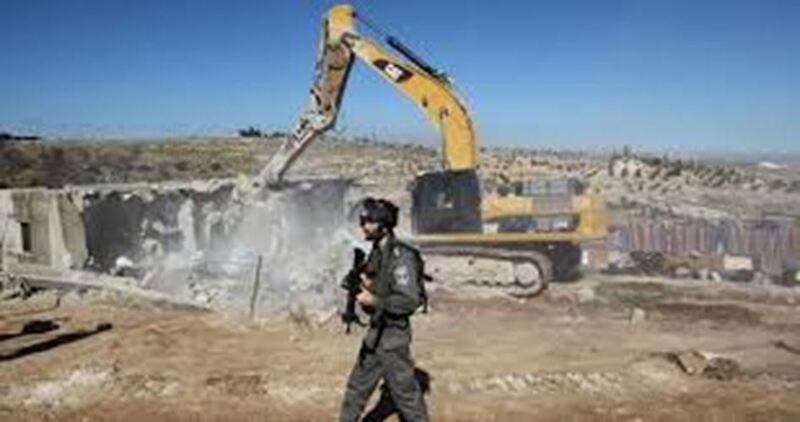 Local residents in Walaja town, south of Bethlehem, managed Thursday morning to stop Israeli Occupation Forces (IOF) from demolishing the exterior wall of a house and from bulldozing a nearby agricultural land. Head of the village council told Quds Press that Israeli forces stormed the town early today to demolish a home wall only to find a large number of Palestinian standing outside the property to stop its demolition. The Israeli forces were forced to withdraw from the area, he added. 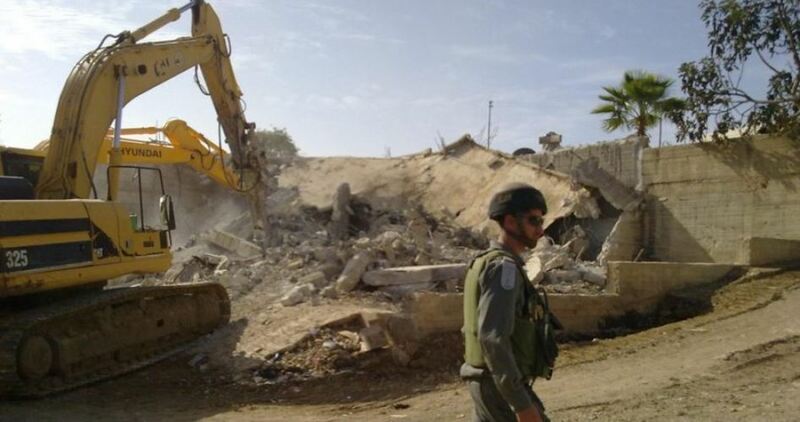 Earlier today, IOF demolished homes of two slain Palestinians and a detainee in the central West Bank province of Ramallah. Israeli soldiers invaded, on Thursday at dawn, Deir Abu Mashal and Silwad towns, in the central West Bank governorate of Ramallah, and demolished three homes belonging to the families of two slain Palestinians, and a detainee, involved in attacks that led to the death of two Israeli soldiers. Media sources in Ramallah said dozens of soldiers invaded Deir Abu Mashal town, detonated the family homes of Bara’ Saleh 18, and Osama Ata, 19, and sealed shut the home of Adel Ankoush, 18. The army wanted to detonate the home of Ankoush, but could not do so since it is very close to many overpopulated homes and flats. On June 16th 2017, the three Palestinians were killed by Israeli army fire, and two Palestinian bystanders were wounded; one suffered a moderate injury, and the other was mildly wounded. Israeli daily Haaretz said the Palestinians were shot and killed after attacking Police officers with knives and guns, killing a border policewoman, identified as Hadas Malka, 23. The invasion and demolitions led to clashes between the soldiers and dozens of local youngsters, who hurled stones and empty bottles on the military vehicles, while the army fired many live rounds and gas bombs, causing scores of residents to suffer the severe effects of teargas inhalation. The army also invaded Silwad town, northeast of Ramallah, and demolished the family home of a detainee, identified as Malek Hamed, 21, who was taken prisoner after the army claimed he carried out a deliberate vehicular attack, killing Israeli sergeant Elichai Taharlev, 20, of the Golani Brigade. The incident took place near Ofra illegal Israeli colony, built on Palestinian lands in the Ramallah governorate. Israeli occupation authorities (IOA) demolished on Wednesday a home of a Palestinian family in Ramle city in 1948 Occupied Palestine. The home was knocked down under the protection of Israeli police and Special Forces at the pretext of lacking a construction permit. A Palestinian activist in the city, Ali al-Qerm, pointed out that the home was owned by Mohammad al-Qerm family who has become homeless. A state of anger has prevailed among Palestinian residents in the city in the wake of the incident as there are dozens of other homes in the town threatened with demolition. The activist told Quds Press that the house’s owner possesses documents that prove his ownership of the home. The family only renovated parts of their house and did not build a new structure as what had been alleged by Israeli municipality of Ramle, he said. 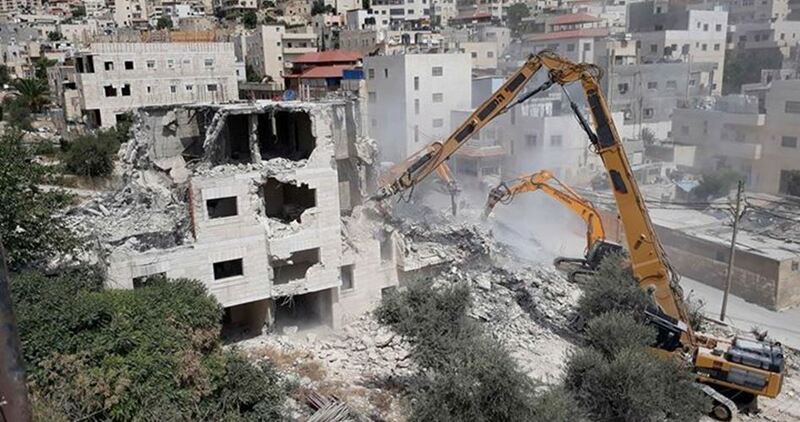 The Palestinian inhabitants in the city charge the municipality with hindering the issuance of construction permits in order to be able to evict Palestinians from the city through home-demolition policy to allow more room for settlers. 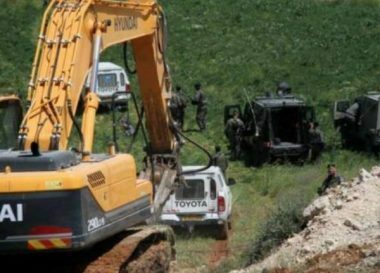 On Wednesday morning, dozens of Israeli soldiers, accompanied by bulldozers, invaded Palestinian agricultural lands in the al-Jab’a village, southwest of Bethlehem, in the occupied West Bank, and bulldozed them to conduct military training. Thiab Masha’la, the head of al-Jab’a Village Council, said the soldiers invaded al-Khour area, west of the village, and started bulldozing the lands, in an area of ten Dunams, owned by the families of Abu Latifa, Hamdan and Abu Lowha. Masha’la added that, a week ago, the soldiers bulldozed a Palestinian land near a military roadblock, west of the village, in order to expand the roadblock. The Palestinian Prisoners’ Society (PPS) has reported that Israeli soldiers have abducted, on Wednesday at dawn, at least twenty-five Palestinians, including children, during massive military invasions and violent searches of homes, in different parts of the occupied West Bank. In Nablus governorate, in the northern part of the occupied West Bank, the soldiers invaded Madama town, south of the city, and abducted Mohammad Wajeeh Qitt, 28. The soldiers also invaded homes in Sabastia town, northwest of Nablus, and abducted Qoteiba Abdul-Karim Azem, 26. In Ramallah, in central West Bank, the soldiers invaded Kobar village, northwest of the city, and abducted Abdul-Jalil al-‘Abed and his brother Ibrahim al-‘Abed, after storming into their homes and searching them. It is worth mentioning that Abdul-Jalil is the father of Omar al-‘Abed, who was injured and arrested by the soldiers, on July 21 2017, after he infiltrated into a home in Halamish Israeli colony, built on Palestinian lands near Ramallah, and killed Yosef Salomon, 70, his daughter Chaya, 46, and his son Elad, 26. The soldiers also installed sand hills on the town’s main road, and bulldozed the street, destroying it. Also in Ramallah, many extremist Israeli colonists infiltrated into Umm Safa village, northwest of the city, burnt two cars and wrote racist graffiti calling for killing the Palestinians, and for revenge for the Halamish attack. In Qalqilia, in northern West Bank, the soldiers invaded and ransacked more than thirty homes in Azzoun town, east of the city, and abducted eight Palestinians, identified as Ali Husam Sweidan, Baha’ Samir Sheelo, Othman Samir Sheelo, Abdul-Aziz Farid Hussein, Yahia Qaher Abu Haniyya, Abdul-Aziz Qaher Abu Haniyya, Nidal Bakr Radwan and Mustafa Sufian Reyashi. 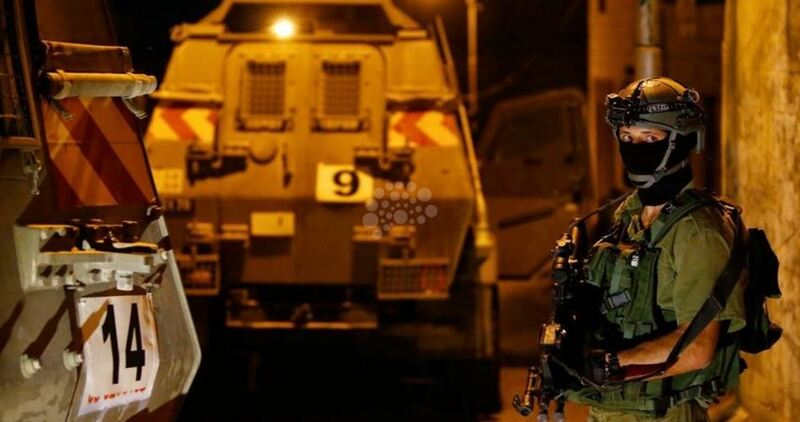 Furthermore, the soldiers invaded and violently searched many homes in Teqoua’ town, east of Bethlehem, and abducted five Palestinians, identified as Thieb Mohammad al-‘Amour, 43, his son Mahmoud, 15. Nizar Khalil al-‘Amour, 16, Mohammad Ziad al-‘Amour, 15, and Amir Waheed al-‘Amour, 15. The invasion led to clashes between the soldiers and dozens of local youngsters, who hurled stones at the military jeeps, while the army fired several live rounds and rubber-coated steel bullets. The soldiers also invaded the Deheishe refugee camp, south of Bethlehem, and abducted two Palestinians, identified as Abdul-Aziz Ahmad Arafa and Raed As’ad Salhi, after shooting and injuring them. The Israeli army said one of its soldiers was injured during the invasion, after exchanging fire with Palestinian fighters, and that it is investigating the incident. 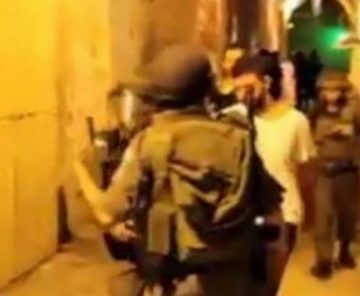 In Hebron governorate, in the southern part of the West Bank, the soldiers invaded many homes and ransacked them, in Hebron city and the nearby towns of Yatta, Sa’ir and Shiokh towns, and abducted six Palestinians. The abducted Palestinians have been identified as the Lieutenant Nasser Maswadi, the head of Palestinian Police in Hebron’s Old City, in addition to Badran Jaber, 70, Amjad Salhab, Yousef Hamdan Halayqa, 29, Ibrahim Mousa Makhamra, 36, and Islam Ahmad Shalalda, 21. It is worth mentioning that Badran is a senior political figure of the leftist Popular Front for the Liberation of Palestine (PFLP). The soldiers also installed many roadblocks, before stopping and searching dozens of cars, and interrogated many Palestinians while inspecting their ID cards. Fanatic Jewish settlers on Tuesday afternoon torched hundreds of dunums of Palestinian agricultural lands in Aqraba town south of Nablus city. 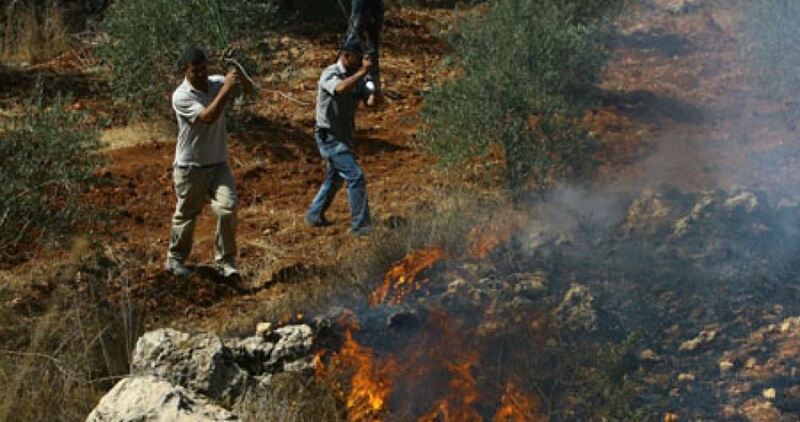 Yousef Deiriyeh, member of the anti-settlement committee in the town, told Quds Press that extremist settlers of Itamar settlement arrived in groups and set fire to lands planted with citrus trees in Ain al-Douweh and Ain al-Jehir areas to the east of the town. Palestinian firefighting teams could not approach the affected areas as Israeli Occupation Forces (IOF) were deployed in the site along with the attacking settlers. Jewish settlers every now and then carry out similar attacks against the town and its inhabitants under the protection of IOF soldiers. 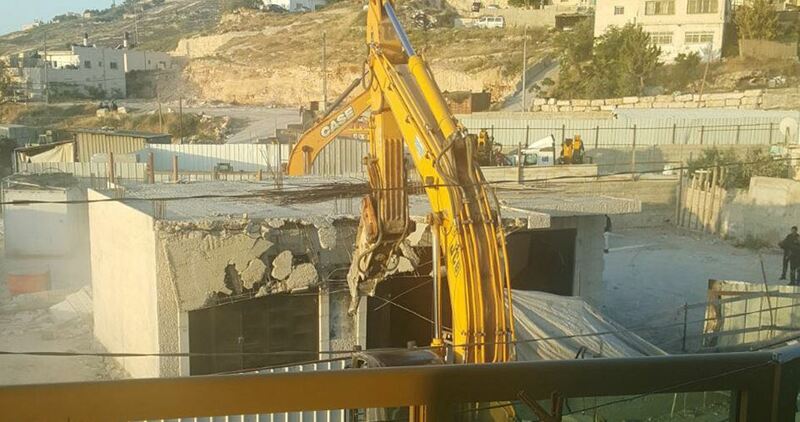 The Israeli bulldozers on Tuesday morning knocked down a Palestinian home in Jabal al-Mukabbir village, south of Occupied Jerusalem city. 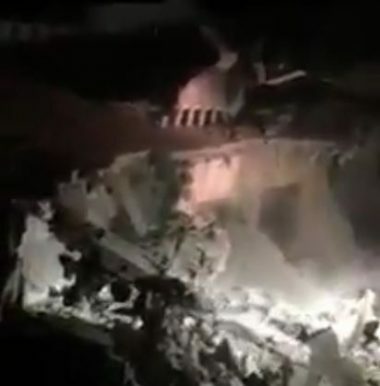 Israeli special forces and municipal crews escorted by sniffer dogs and bulldozers stormed al-Rebay’iya neighborhood, in Jabal al-Mukabbir, and cordoned off the home of al-Shaloudi family before they forced all the residents out and reduced the building to rubble. The house owner, Sana Hilseh al-Shaloudi, said the Israeli occupation authorities demolished her family home without prior notification. 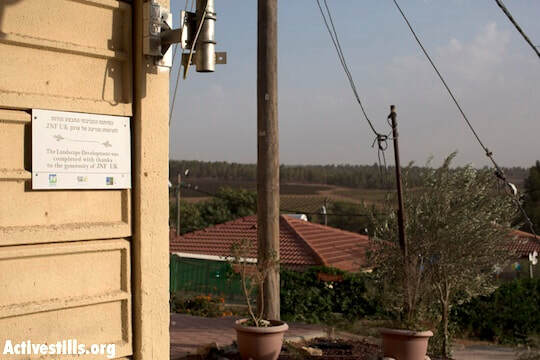 Sana said that as soon as the Israeli forces showed up at her home she contacted her lawyer. The latter managed to obtain an order delaying the demolition but to no avail. The house owner added that she has been living in the 65-meter-square building with her husband and two daughters for three months. Her husband, Hamza, said the Israeli municipal crews refused to adjourn the demolition, paying no heed to a court rule obtained by the family’s lawyer to that very end. 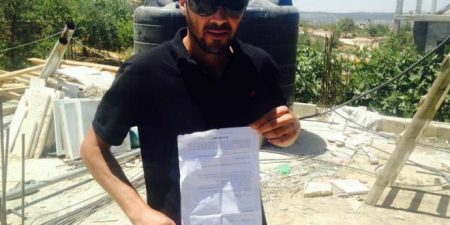 Mayor of Silwad town affirmed that Israeli soldiers handed the residents demolition orders for industrial facilities, a house, and a school under the pretext of being built without permits. According to Quds Press, the notified Salam School serves more than 400 students. Appeals are scheduled to be filed against the Israeli orders especially that the threatened facilities are licensed by the Palestinian municipality, the mayor pointed out. The Israeli authorities seek to displace dozens of Palestinian families from their towns in a prelude to expand nearby Israeli settlements. The Israeli occupation forces on Monday evening sealed off the main entrances to the southern West Bank province of al-Khalil with makeshift checkpoints. Israeli army troops set up checkpoints near the western and northern access roads to al-Khalil, where Palestinian vehicles and civilians have been subjected to intensive inspection. The Israeli forces also pitched a flying checkpoint near Beit Ummar thoroughfare, north of al-Khalil, and seized several Palestinian cars. 22-year-old Mus’ab Ibrighith had been detained by the occupation soldiers for over two hours. Palestinian workers have also been made to endure exhaustive searches and harsh crackdowns as they passed through a checkpoint set up near Idna town, west of al-Khalil.